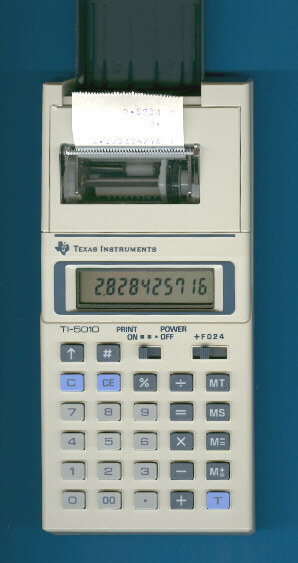 The TI-5010 - successor of the TI-5025 - is one of the early printing desktop calculators using normal paper. It relies on Japanese components and manufacturing capabilities. The backside of the calculator states clearly "MADE IN JAPAN" and it is easy to locate its true genes. Dismantling the TI-5010 reveals immediately the Toshiba LC-1028PV as its sibling. Fellow collector Stefan Klaes discovered recently in a TI-5010 a printed circuit board (PCB) with a short designation "EC-3009". This magic number leads to a Radio Shack EC-3009. Compare some other TI calculators with their siblings manufactured by Toshiba. The TI-5010 sports the "office grey" design of other products. Five years ago with the TI-2800 Paperless Printer a new concept of small desktop calculators was introduced.